A recent Wall Street journal " published " the Amy [Amy Dockner Marcus ( April 222003 ) ] to write an article, which mentions some can avoid rhinitis operation treatment method, this topic caused a big discussion. In today's world has advanced diagnostic tools to the disease and have a better understanding of the times, this is not what the Arabian nights. The article mentioned in this disease with special emphasis on rhinitis, rhinitis patients using saline nasal wash method can avoid rhinitis operation. In my practice, I have been to the electric nose washing apparatus used in more rhinitis types. In particular, many of my rhinitis patients through the use of saline nasal wash method obtained good therapeutic effect. And did not perform rhinitis operation, but in the use case up to now for a long time, they have been very good. What makes saline nasal wash method is so effective? That is because the health of the nasal cavity is the key to a healthy nasal cilia. The reasons caused numerous rhinitis is nasal cilia function is not normal. Nasal cavity nasal cilia is the guard, they are responsible for the nasal discharge and nasal secretions are fetching a bacterial allergens and other dirt removal of nasal cavity. If the nasal cilia once the abnormal, these secretions will in the nasal cavity packing, as to stop the flow of rivers, the river will become more and more dirty. If the nasal cilia in normal work, put these secretions cleared out, then the bacterial allergens will be cleared without entering the body. Healthy and normal nasal cilia is the key point of nasal health. If you can restore nasal cilia in normal function, then you may not have rhinitis operation. 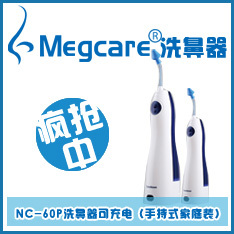 Electric nose washing apparatus can cause impaired nasal cilia returned to normal operation, the cavity inside the dirt removed from the nasal cavity nasal cilia, to provide a better working environment, and thus bring other improvements. Many research papers have proved this conclusion through the clinical verification. After practice verification, many of my rhinitis patients to avoid the knife under bitter. If your doctor on this method more familiar words, your doctor will also ask you this suggestion. Restoration of nasal cilia in normal state will solve some rhinitis operation can solve other chronic symptoms of rhinitis. Runny nose is impaired because of the nasal cilia make nasal secretions becomes sticky, which flows through your throat when you feel. Electric nose washing apparatus on the effect is also very good. For runny nose caused by throat discomfort, also will have the very big improvement. For allergic rhinitis, electric nose washing apparatus can be effective removal of nasal allergen. Here, I only refers to the electric nose washing apparatus, and does not include those who have very old nose washing method. Electric nose washing apparatus compared to those who like yoga nasal wash this ancient method of operation has achieved very great progress, so the effect is more ideal than they.